Uninsured older Americans shell out $1,126 annually, on average, for dental work, which is $400 more than people with coverage spend. Out-of-pocket costs can be much higher in a year when extensive work is required. There is also a hidden cost to not being covered. Failing to deal with dental problems can cause other serious illnesses, from malnutrition to heart trouble. For the rest of the U.S. population, cost has become less of a barrier to dental care, the American Dental Association reported in 2015. Seniors are the lone exception. One in four Medicare beneficiaries polled two years ago said cost is a higher barrier to dental care than it is for any other type of medical service, including hospital care and prescription drugs that are covered by Medicare. Getting dental care is especially difficult for people over 65 with low incomes. While state social programs cover low-income children, coverage rates have declined for their low-income grandparents. 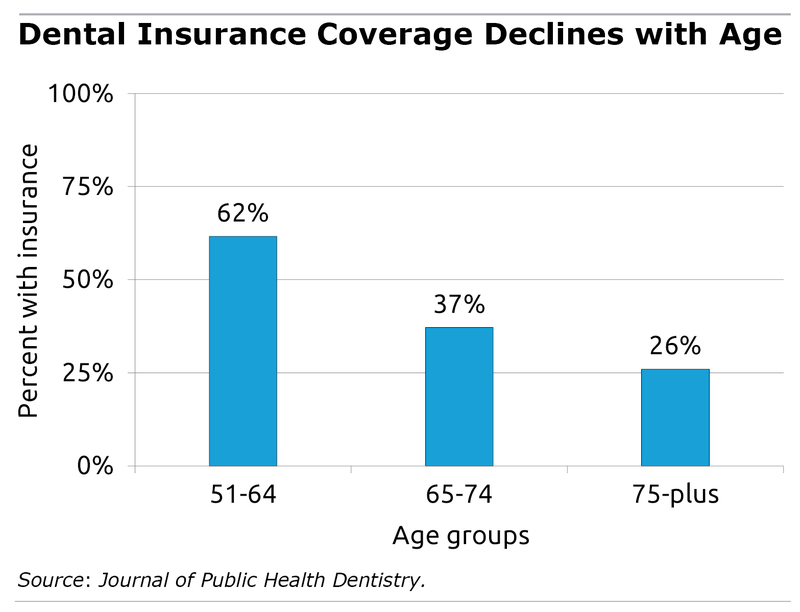 Many uninsured middle-class retirees also struggle to pay for dental care. Half of older households earning as much as $50,000 haven’t seen a dentist in the past year, and 21 percent earning more than $75,000 haven’t been to a dentist, according to an Oral Health America survey in 2015. A “lack of money or insurance are the prime reasons to skip a visit,” the report said. In rare instances, Medicare covers dental procedures as part of overall medical care, such as a tooth extraction prior to heart surgery or a dental procedure prior to radiation for oral cancer. Most seniors aren’t covered, and they either prefer to go without it or can’t afford it. Anyone who is lucky enough to live in or near a large city may have access to a dental school, which offer much lower prices. Though they don’t always accept dental insurance directly, they will provide you the paperwork so you can submit a claim to any insurance you may have. I’ve been going to Midwestern University Dental Clinic in the Phoenix area for several years, and it’s been great! They’ve saved thousands of dollars in dental work. Great advice on the dental school idea Trudy! I tried it myself once to help a friend who was completing her schooling at Tufts Dental. I second the advice about dental schools. I was visiting New York, and had a dental emergency, with no dental coverage for the situation. A colleague told me about New York University’s dental school clinic. Great dental care for a nominal charge of about $200. It would have cost me about $1,800 at the dentist I had originally contacted in the emergency. I’m in my early thirties and have never been covered by an employer. It’s been a financial pain to cover things out-of-pocket, but it is helping with the literal pain. Now that I have more income, I am more able to take care of this. Reaching out to the state department of health, or search your state for an Oral Health Coalition (various names may identify this group) and ask about a Safety Net list of dental facilities across your state. TN has such a list…and while it is not yet comprehensive, it is a great tool to be able to offer when we (in the department of health) receive a call from a consumer. To recap…reach out to the Department of Health, Oral Health Division of your state; look for an Oral Health Coalition in your state; check out Oral Health America’s website for the Wisdom Tooth Project in your state. This is clearly a smart way to plan – take good advantage of current employer-sponsered dental coverage or take advantage of the fact that things might be cheaper now. Additionally, even if there is no cost advantage, it might be the case, paying the expense upfront (this can applied be for more than just dental work) will reduce overall risk. By paying now, you’re — in a way — reducing the overall uncertainty. This is an effective risk management technique for your personal finances. Thanks for sharing this info here, this is really good insight.